Looking for the best diaper bags in India? Being a mother, you would be probably aware that you will need many things after the baby’s birth. Every time you leave your home taking your baby alongside, you will feel the need for a diaper bag for carrying baby sanity & nursing things. There are many diaper bags available online but choosing the one for your baby becomes confusing in the midst of a myriad of diaper bags. 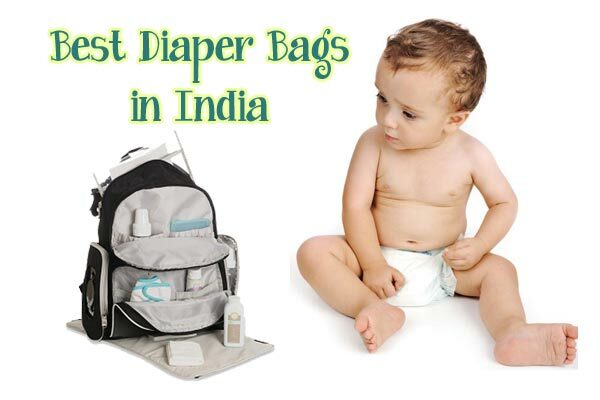 It’s better to consider some factors to help you zero in on the best diaper bags in India. How to Select the Best Diaper Bag? Style: There’s no point to buy something weird & follow others. I understand you are a mom, but still, you should select a good looking diaper bag. Cost: Never buy an expensive bag before at the end it’s just a Diaper Bag/Nursing Bag. You should consider style as well as looks but purchasing a costlier just because of these factors isn’t worthy. Capacity: It depends on you whether to select small or large. Big has got an advantage of offering you ample space & Small ones are easy to handle. Both have pros as well as cons. Water Resistant: It’s recommended to buy a waterproof diaper bag. Unisex or not: At some point in time dad might have to carry this bag so choose wisely. If he plans to take the bag, then don’t go for a girlish one.Let’s see few of the best diaper bags in India available online. R for Rabbit’s Caramello Diaper bag is a smart & fashionable bag for modern moms. This backpack offers you comfort & space accompanied by good looks (style). You can also use this diaper bag for daily use because it’s so trending & looks like a regular bag. You get a fully open design that can comfortably accommodate 15-inch laptop + all baby nursing things. The product comes with 9+ pockets including insulated pockets for bottles. Caramello Diaper Bag is made up of Oxford Fabric with waterproof fabrics & hence washable too. This 2-Shoulder strapped backpack is available in 3 colours: Blue, Pink & Red-Black. Large Capacity: 15-inch laptop + baby accessories can fit in. Motherly Diaper Bag Thrift Version might be the only one that offers you 12 different coloured backpacks. However, there are only four colours available on Amazon right now. It is a lightweight bag made up of waterproof fabric that is eco-friendly. Coming to the capacity of this bag, it has a total of 13 pockets external + internal. You get three insulated milk bottle pockets, 1 Tissue pocket, 1 Water bottle pocket & 7 Storage pocket. These pockets are placed separately to make this product organized. Here also you can carry a laptop & baby accessories easily. According to looks, it’s fashionable, but men’s won’t like to carry this. Multifunctional: Can be used as a nursing bag & shopping (occasionally). This product is identical to #2 but has a Unisex design. You get 14 different colour variations for this one specific product. A brand new premium quality made diaper bag that is EN71 Certified by European Standards. Buying this product is an advantageous deal because you will get three different sized bags, one bottle bag & one Diaper Mat at a reasonable price. Each bag provided is entirely waterproof & easy to clean. You also get removable large pouch & wide opening changing bag. You can easily carry this bag anywhere. It comes with two handles & shoulder strap that are adjustable. There are only three colours available for this product. The drawback of this product: Carrying five bag isn’t an easy task. Coming to pockets you are getting Top-zip closure, two side pockets & 1 zipped pocket each on front as well as backside. Looking into interiors, you get one inner zipped pocket, key & cell phone pockets, two main cabins & sturdy/durable feet. The product consists of 2 elastic bands inside that are capable of keeping cups & feeding bottles. Also, three side pouches that can comfortably accommodate baby stuff. The detachable bag is useful for playtime or short-trips while the main bag offers you more space. An ideal choice for both parent because of its unique unisex design. This diaper bag is a perfect combination of style, multiple compartments & spacious interior. There’s an adjustable shoulder strap that allows you to make this backpack a shoulder bag or a tote. The bag has two main compartments: Larger compartment to accommodate feeding stuff & another zipped compartment for nursing/diaper, burp cloths or other items. Additionally, insulated bottle pack & multiple zipped compartments are integrated with this backpack. One unique feature in this bag is “Wipes Dispenser.” To provide access to wipes while some spill, wipe dispenser is provided & placed at exterior. Changing pad is also inclusive with this bag & is easily removable. Every pocket is zipped to ensure safekeeping. Drawback : Wipe dispenser isn’t spacious to accommodate an entire pack of wipes. T-Bags have come up with MB19G which is a unisex bag with a large capacity. It’s an ideal choice for parents who usually travel & want to carry their baby’s things. The bag consists of 1 Main compartment, 3 Bottle Holder & 13 pockets. MB19G weighs only 800 grams & is quite light weighted. The product also offers you “Tissue Dispenser,” tissue & wipe dispenser is quite similar to just word difference. The material used for this product is Oxford Fabric of high quality & this product is waterproof. This bag is stylish & you won’t feel annoying even if you take this bag for office or traveling. This multifunctional Diaper Bag can without much of a stretch store your baby’s water bottle, burps cloth, diapers, towel and many more baby accessories. The bag has numerous pockets to store your child’s different necessities, and this bag enables you to keep things sorted & make them effortlessly organized. Made up of High-quality Oxford material, this Bag is waterproof which makes it safe from water spills. With the option of shoulder lashes and simple tote adjustable handle, this maternity bag is ideal. The backpack weighs 720 grams & good for traveling too. Drawback: Might be it’s not washable because waterproofing is only for exterior & that makes me say it as slightly overpriced. Utopia Alley Allcamp Diaper Bag is an expensive diaper bag. This bag is best for moms who want to pack stuff for a full day away from home because of its large capacity. This bag is polyester made & has total 19 pockets. There’s only one main compartment that has a zipper closure. You also get large pockets for keeping wet items & you can quickly sort out dry & wet ones. Shoulder straps are hang-able to a stroller. Here too you will get Wipe Dispenser. It’s expensive than other bags. Few buyers have reviewed this product as uncomfortable because few people feel it stiff & tight.